things which lurk in darkness. Every circus has its freaks. 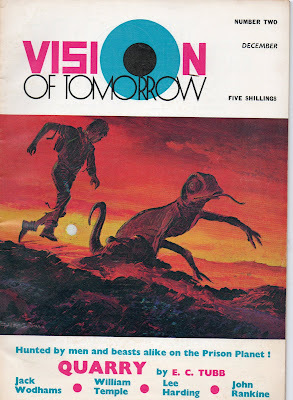 One thing that struck me about the interview you did with Charles Platt (published in ‘Who Writes Science Fiction?’, Savoy Books, 1980) is that – even having been published regularly since the 1950’s, you were still having to work a ‘day job’. Oh yes, yes. It wasn’t until fairly late that writing became a full-time thing. I think I quit full-time work in 1968. As I told you, before that – around the time I got my house, the bottom dropped out of the pulp market, and I had to go back to work, working for a printing-machine firm called Adana. Later I worked part-time there because things were getting better, and I got an agreement with the Guv’nor to work when he needed me. It suited him ‘cos he was saving money too. Then they made me manager. I said I’d never been a manager before and I was the worst man they could’ve picked. It was a Mickey Mouse firm anyway. I didn’t want to do it, but I was a manager for a while. I was there. And it was regular money. But in 1968 we finally parted company, and I went writing full-time. Then – after a while, I suppose if you want to get a bit philosophical about it – as I was saying at a recent Pulp Convention, you pay a lot, in a way, because you’re not living. You’re writing about living. And it’s a phoney life. And oddly enough – this is the room, this is where you spend your time, day after day, sitting at the typewriter. You get tense. You get strained, because you don’t want to do it. You get this adaptation-syndrome coming on. Your back aches, and your mind aches. And it’s a load of crap you’re doing. (Graham Greene writes about the same syndrome as a ‘melancholy which falls inexorably round the novelist when he has lived for too many months in his private world’). So, I began demonstrating, ‘cos – you see, you desperately had to do something else, otherwise it would drive you mad, just sat in this room, you didn’t know what to do. And by this time I’m slowing down, that’s the snag. This time it’s getting harder and harder to write. So I went demonstrating, which is nice. I liked that. Then that dried up, inflation was to blame. By the time I’d paid expenses there was nothing left. I was actually paying to go to work! Then I got the last job, as a Traffic Warden. I was only doing it for six months when I got punched in the mouth. I’d put a ticket on his car, so he came up and punched me in the bloody mouth. Got a cut lip. I was the only Traffic Warden on that particular patch to be physically assaulted. Forget how much compensation I got. Then I had a run-in with somebody else and I thought ‘I’m not going through this again’. The abuse you get in that business. I just couldn’t stand it. So I quit. And since then I haven’t worked. Doing a ‘day-job’ seems to have been a not-uncommon experience among your generation of writers. Philip E. High was a bus-driver. E.R. James was a postman. The money wasn’t in there you see, that was the trouble. In our day-and-age, the money wasn’t there. But in the Platt interview – and from what you’ve just told me, you also seem to imply that working a day-job can be an advantage in that it also stimulates your creativity, throwing up situations and incidents. It’s wrong to stay in-doors, that’s true. Because you’re bound to restrict yourself. But coincidentally this all started when I stopped smoking, believe or not. I was alright until I stopped smoking. Or smoking stopped me – it gave me up! You put in a story once, that humans were the only species in the universe with the irrational compulsion to smoke. Yes, because, I mean – nicotine is a brain-stimulant you see? And when I stopped doing this in 1972 – no, 1975, that was it, I remember the date, because I was on this demonstration job, the last demonstration job I did, I’d been to a party, I came back from this spell down in Brighton – not smoking any. Got back, lit up – and I’d never felt so ill… I was terrible, as if I’d never smoked in my life. And I’ve never smoked since. But of course, it made life very hard for two reasons – when you’re smoking and you’re writing, you stop writing to light the cigarette and have a puff, and it gives you a pause to think out the next line. But when you’re like this – AAAGH, bloody crap, and you look at it, it’s not crap at all, it’s just you who don’t know where to go next, you’re stuck on a line. So the writing really slowed right down. As an illustration of what I’m saying, I used to write with a minimum of waste. Then it got so that I was wasting three sheets to every one finished. I can tell that because I’m starting off with two reams of paper – fifty sheets of finished product. It got stupid. That’s when I almost clipped off – and stopped writing. But getting back to talking about this concept of writing – being isolated, with a super-active imagination, you are god, writing about people and ordering their lives. Then you enter the real world, and you find it very very hard to communicate ordinarily with people. I did. I couldn’t talk to people. I could talk at them. I could do that on a demonstration wonderfully. But talking to them, I always found that very difficult. Because we don’t seem to think alike. I mean – you’ve got a different sense of humour. Or you’ve got a grass-hopper brain. You might say ‘ah, we couldn’t do this on the moon’. ‘Eh? – funny sod this, keeps talking about the moon’. Or Einstein. Or Darwin… so your conversation begins to get a little bit odd. Philip E. High would say that as he was driving his bus, or as E.R. James was delivering his letters, they would be working on ‘automatic pilot’ while their minds were elsewhere, on different imaginary journeys. That’s right. You do that driving a lorry. I used to say to people ‘if you were to ask me ‘what did you see?’ while you were driving that lorry, I couldn’t tell them. I could tell you what didn’t happen. I didn’t have an accident. I didn’t kill anyone. But I couldn’t tell you what happened. Because your mind switches into overdrive while your body operates on an automatic level. You bought several Philip E. High stories for ‘Authentic SF’. He told me he was very pleased with the cover-art you commissioned for one of them. No, I didn’t do the covers, that was the trouble. I had nothing to do with covers. Covers and magazines were two different things. I don’t know how it works now, but then you never even saw the artist. We were never up in that editorial bracket. No – Christ, you didn’t know what the hell they were doing when they were illustrating your stories. Usually, what they’d do, they’d have a cover or two put by, and they’d think ‘well, this one would do it!’ So we’d get into the ridiculous situation where – was it with ‘Authentic SF’? No – it was ‘Scion Books’, where we had identical covers used for two entirely different stories. One was called ‘City Of No Return’, and the other was called ‘Hell Planet’. Phil (Harbottle) will confirm this. That they both have the same cover. It’s just – ‘we’ll use this one again’. It didn’t matter. The artists used to suffer quite a bit in those days, too. All in all they had a hard time. As bad as the authors. It got to the point where one artist went in there, he’d had a gut-full of them, he was going to punch the publisher out. Not only were they not paying him but they were ripping him off by re-selling his stuff and re-using it. Now – of course, they are highly respected individuals, they retain control of their covers and all this business. They didn’t in those days. ‘Do a cover with a spaceship on it’, and they’d bring it in, and they just sold whatever it was, for £10, £20 each. Very rarely did they even get to see the stories in those days. Although sometimes the author would be given a cover to write a story about, to justify it being there. And you could usually tell when that was the case, because you always found a very concise description of the cover-scene in the story. A dead give-away really. That happened quite often on all the magazines. The pulps as well. I always enjoyed Science Fiction that restricted itself to a Solar System setting. Known worlds with mythologies built up by a succession of writers. I know. Science shot us down, didn’t it? We had a Mars, it was ideal. We had a Venus too – all swamp, with dinosaurs running around. We had asteroids out there. It was perfectly nice. And they go and ruin it. They’ve even made a mess of the Moon now. Setting stories within the bounds of the Solar System must have forced you to write within a kind of discipline. Even though many of the ‘facts’ you adhered to have subsequently been proved wrong. It did. It was a help really because you were operating against a ‘known’ background. Which meant you were writing near to reality. Again, the only difference was that you hadn’t actually been there. You could have your characters on Mars. And you did know… I mean, when you think about it really, if you wanted to be really cynical you could’ve put them in any desert, in the middle of the Sahara, and the story would’ve been exactly the same. Freezing at night. No air. No food. No nothing. They’re really stories of conflict among people set against themselves in a small community. But then, most Science Fiction was like that. Your monsters weren’t just giant ants or slugs, your monsters could just as easily be the locusts eating the crops from under you here on Earth, or all that kind of thing. So really – getting back to the original question, there are only a certain amount of situations, as there are only a certain amount of plots, as there are only a certain amount of character-types. And they’re just interchangeable, one against the other. And so, it’s hard – I should think, now, to come out with a completely new and novel idea, one that is not just retrieved or refashioned in the usual way. I mean, Arthur Clarke made his things very very big, and so did Larry Niven in his ‘Ringworld’ series. All the descriptions are in miles. It was so big that the mind couldn’t comprehend it. But really, it didn’t mean anything, did it? Just ‘cos something’s so bloody big – a five-mile-long spaceship, it’s in no way really different to a half-mile-long spaceship. It doesn’t make it necessarily any more awe-inspiring. It just makes it larger. To me, the landing on the Moon seemed like a significant terminator, where it tilted emphatically from Science Fiction into science fact. And since then… I suppose so, yes. And you actually contributed to the commemorative anthology of Science Fiction writers’ reactions to the event, ‘Men On The Moon’. It was one of those things (laughs). That was just… extrapolation. I suppose, it had happened, and to me – I could never understand at the time, when Yuri Gagarin went around the Earth, when he had PROVED Science Fiction not to be the giggling silly thing people thought it to be. Not like the Royal Astronomers who called it a ‘whole load of rubbish’. Then we actually got to the Moon! We – as Science Fiction people could at least have had a party to celebrate the culmination of a dream. We didn’t. Nobody did. Nobody cared. Reaction was non-existent. They’d proved it could be done. This was what all of the stuff is about. Doing it. Only it wasn’t, of course. What we were looking for was escape. And really, we resented them getting to the moon. Because that was the best avenue of escape we’d ever had. And they showed us what going to the Moon was really like. And Mars, of course, was worse. No more Dejah Thoris, no more John Carter, no more Lost Cities where anything could happen. We couldn’t do that anymore, you see. So we had to travel further out, didn’t we? Never mind Einstein – he was wrong. We got out of the Solar System to the stars. And that’s really the story-teller always running away from reality all the time. Getting away from it. Then fiction-writers began going backwards as well, back in time to re-invent the old sooth-sayers, sorcerers and witches, elves and hobbits. The bloody ‘Middle Earth’ thing – oh god! What was it – ‘Lord Of The Rings’? Which might be a wonderful story and all that, but it’s not for me. I just can’t. It’s a kiddies yarn, and that’s all there is to it. 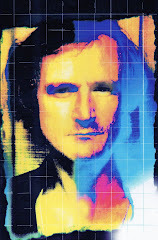 Another effect of the ‘intrusion of reality’ onto Science Fiction was the so-called ‘New Wave’ which happened in Britain when Michael Moorcock took over as editor of ‘New Worlds’. Well, I don’t know. It had an effect on it. But I don’t know if it was a good one. Because the writing they were doing could have been anything. It was kind-of ‘novel’ writing. To me, it wasn’t a direct off-shoot of Science Fiction or anything like that. It was ‘Speculative Fiction’, in the real sense of the term. But to me it was more than an off-shoot. It was something different. I mean – it had been around before, and it’s still around. It’s like poetry. What is poetry? It’s what we choose to call it. So – you’re getting my concept of poetry, which is rhyming – the old ‘the moon’s a ghostly galleon’, or you’re getting the so-called free modern poetry which to me is just prose cut-up and stuck together. So the ‘New Wave’ writing… it did break down barriers, it was good in many ways, but it didn’t really carry everything with it. Because you got a lot of emulators, and they normally write pretty-much the same sort of stuff. That’s fine. And there again, not to denigrate anyone, but John Brunner did it with his ‘Stand On Zanzibar’ and his ‘Jagged Orbit’, ‘The Sheep Look Up’ – all very good books, all with a message. You can go so far down this route, and he did, he carried it very well indeed – ‘The Sheep Look Up’ is a great and horrifying book, if we’re talking about horror. But there it is. We’re living in it. It’s no longer in the future. It is now. Well – ‘Stand On Zanzibar’, that will be next week! But still there’s room for the so-called ‘Space Opera’. The action story. Not just the sort of ‘see-how-clever-I-am-that-I-can-produce-this-sort-of-thing’. It seems to me that the Moon Landing, as you say, closed off one particular area of writing, therefore the ‘New Wave’ had to look for new avenues. But it also bears on what you were saying about ‘how close can you get to reality and still be SF?’ Exactly. So they tried to go inwards, exploring inward motivation. Which I think is very interesting – no doubt. I suppose, when you get into the ‘speculative’ going inwards, you’re starting to explore, let’s call it – for want of a better word, a state of ‘lunacy’. When I say ‘lunacy’, I mean not normal, in the sense that there’s no absolute definition of lunacy. When I say lunacy – if you’re going to talk about a normal man doing a normal job, you haven’t got a story. So you’ve got to sort-of stretch it a little bit. ‘He looked at the legs that were passing, and inwardly drooled…’ Now you’re talking about a man with an obsession. Now – how far does the obsession go before it… and this might be a great deal of fun for you and I to write about. But there’s stuff I can’t tolerate reading, and never write. Sort-of depicting cruelty to animals, and people do that. I always remember the beginning of the movie ‘The Wild Ones’ where they’ve got this scorpion surrounded by ants. I saw nothing in that. Nothing entertaining. Educational. Or necessary in any way. Why the hell do it? So when you get people doing this – probing inwards, I’m not saying people don’t think this way, but I don’t want to read about it, I don’t like it, and I’d rather it just wasn’t there. But that’s just me. As ‘New Worlds’ was going into its experimental phase, Philip Harbottle’s ‘Visions of Tomorrow’ continued to champion the more traditional style of SF narrative. Yes, they were. That was deliberate, I think. But old Phil was unlucky on that. It’s a shame. It was a bloody good mag. And it did turn out a very good thing. The stories were good. The publication, the whole thing was nice. It just had distribution problems. There was a rupture in its distribution. It was timing – had he done that in the 1950’s, for example – you see, no problems! But it was the same with ‘Nebula’. ‘Nebula’ again was a good mag, which could not break the distribution network. Unless you’re in with WH Smith and people like that, you’ve had it. And obviously – unless they’re displayed, they can’t be sold. My own trouble with ‘Arrow Books’ was similar. I used to go to the person at the publishers and say ‘look, I’m walking through a train station, Victoria or Waterloo, and I go along to the bookshop, and I cannot see my work, I cannot see my books. Why aren’t my books being sold there?’ That’s when I learnt, yes – we do sell there, they buy half-a-dozen. But when they’ve gone they won’t re-order. The managers won’t, they’ve sold their half-a-dozen, that’s it. And the mechanics of this are cruel. ‘Cos with Smiths and Menzies, one or two people have the distribution monopoly by the shelf, and unless you play their way by their terms – y’know, if they don’t want you, that’s it. They are the ones who call the tune. So my stuff was never sold as it should have sold simply because it wasn’t displayed as it should have been displayed. So – in the publishing world it’s not what’s good, it’s what is sold. What they choose to hype up, what they choose to launch or push. Your ‘Earl Dumarest of Terra’ novel-series sold very well in the USA. The ‘Dumarest’ novels did. They’ve been a great friend to me – old ‘Dumarest’. My saviour you might say, literally my saviour. That’s another thing. For ‘Ace’ – for the first eight books they ran to 50,000 words. I’d already done no.9 – then ‘Ace’ goes over to somebody else (‘DAW’). And they want 60,000 words. ‘Mayenne’ was the story. So we have to put in more words. How do I put in 10,000 extra words? They go in the middle of it actually! That was another stretching exercise! But ‘Dumarest’ books went on and on… until, eventually they dried up. They continued going in France. They reprinted the whole run in France. Plus novel no.31. Novel no.32 was written and a contract was signed. But whether 32 will ever see the light of day in an English publication is something else, I don’t know. I’d like to see it (in fact ‘Dumarest Saga no.32: The Return’ was eventually published by Gryphon Books - ISBN 0-936071-83-4). And I’ve since hoped that someone would reprint them – all the ‘Earl Dumarest’ books, in a thicker format. I don’t know what it was with the ‘Dumarest’ books – perhaps they were too thin? That’s another possibility, the era of the thick book began creeping in. People buy by size. And these were all done on 60,000-word length, like I say, 50,000 originally. But they could all be put together. Several of them were written as sequels to each other. There’s one that’s really a triple, there are two that are triples. So they could make a nice thick book. Omnibus editions. A bloody good thick book too, because I’d revise it – I’d put some more in and take some out. A nice 120,000-worder with bags of action in. But no. 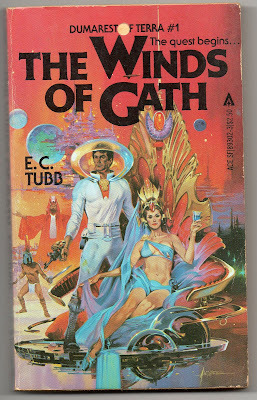 EC Tubb for help, inspiration, and for their kind indulgences.